Nerve blocks consist of injecting the agent into the region of a nerve trunk or other large nerve branches. This form of anesthesia blocks all impulses to and from the injected nerves. Spinal anesthesia consists of injecting the agent into the subarachnoid space of the spinal canal between the third and fourth lumbar space or between the fifth lumbar and first sacral space of the spinal column. This form of anesthesia blocks all impulses to and from the entire area below the point of insertion, provided the patients position is not changed following injection of the agent. If the patients position is changed, for example, from dorsal recumbent to Trendelenburgs, the anesthetic agent will move up the spinal column and the level of the anesthesia will also move up. Because of this, care must be exercised in positioning the patients head and chest above the level of insertion to prevent paralysis (by anesthesia) of the respiratory muscles. In general, spinal anesthesia is considered the safest for most routine major surgery. Epidural blocks consist of injecting the agent into the epidural space of the spinal canal at any level of the spinal column. The area of anesthesia obtained is similar to that of the subarachnoid spinal method. The epidural method is frequently used when continuous anesthesia is desired for a prolonged period. In these cases, a catheter is inserted into the epidural space through a spinal needle. The needle is removed, but the catheter is left in place. This provides for continuous access to the epidural space. Saddle blocks consist of injecting the agent into the dural sac at the third and fourth lumbar space. This form of anesthesia blocks all impulses to and from the perineal area of the body. Caudal blocks consist of injecting the agent into the sacral canal. With this method, anesthesia is obtained from the umbilicus to the toes. GENERAL ANESTHESIA. General anesthetics cause total loss of sensation and complete loss of consciousness in the patient. They are administered by inhalation of certain gases or vaporized liquids, intravenous infusion, or rectal induction. The induction of inhalation anesthesia is divided into four stages. These stages and the bodys main physiological reaction in each phase are explained below and depicted in figure 5-3. Stage 1 is called the stage of analgesia or induction. During this period, the patient experiences dizziness, a sense of unreality, and a lessening sensitivity to touch and pain. At this stage, the patients sense of hearing is increased and responses to noises are intensified (fig. 5-3). Stage 2 is the stage of excitement. During this period, there is a variety of reactions involving muscular activity and delirium. 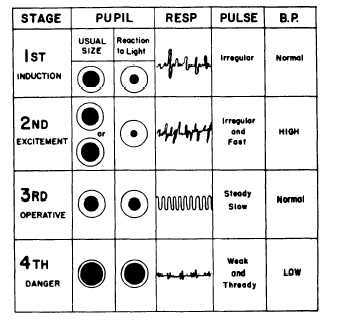 At this stage, the vital signs show evidence of physiological stimulation. It is important to remember that during this stage the patient may respond violently to very little stimulation (fig. 5-3). Stage 3 is called the surgical or operative stage. There are four planes to this stage.